I’m pleased to announce that this post was chosen from 75 entries as a Finalist for the 2013 Science Seeker Awards for Best Blog Post in Psychology & Neuroscience. 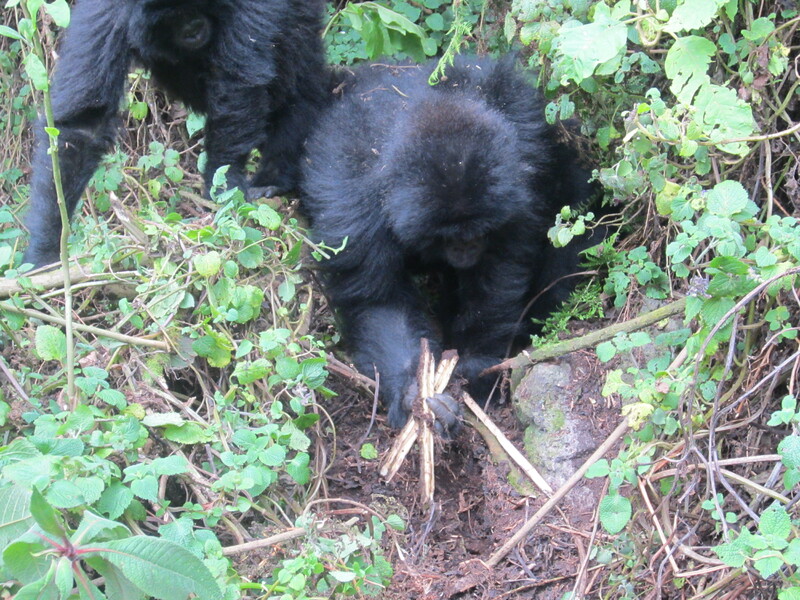 On July 17, 2012 several young mountain gorillas did an extraordinary thing: They dismantled a poacher’s snare. A young mountain gorilla breaks a snare. John Ndayambaje, a field data coordinator for the Dian Fossey Gorilla Fund was working in Volcanoes National Park, Rwanda near a group of mountain gorillas known as Kuryama’s group, when he noticed a snare. Snares are illegal (but ubiquitous) in the region and are dangerous, especially to young gorillas. Realizing the animals were moving towards the snare, Ndayambaje decided to deactivate it. Silverback Vuba pig-grunted at him (a vocalization of warning) and at the same time juveniles Dukore and Rwema together with blackback Tetero ran toward the snare and together pulled the branch used to hold the rope. They saw another snare nearby and as quickly as before they destroyed the second branch and pulled the rope out of the ground. I called Erika Archibald, Ph.D., Communications and Marketing Director for The Dian Fossey Gorilla Fund International to find out. Erika agreed that to scientifically prove the animals’ intent would be hard, if not impossible, to do in a wild setting. However, given the sequence of events, the speed at which the gorillas responded, and the expertise that the gorillas showed, the researchers are confident that the gorillas’ actions were not only intentional, but were practiced. “It was very clear that these animals knew what they were doing,” she told me. 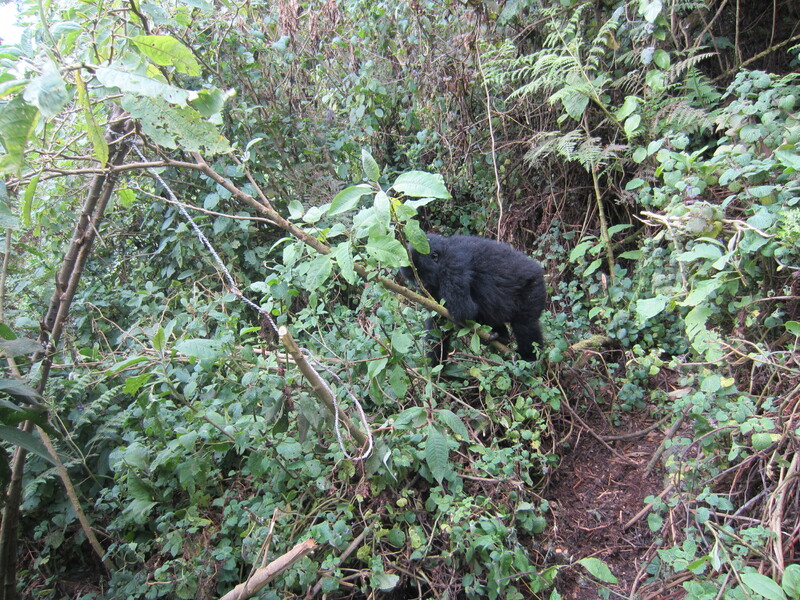 “Snare aware” mountain gorillas like this one have been known since Dian Fossey’s time. The snares themselves are not complicated. They consist of a loop of rope, vine, or wire hidden on the ground under a bit of dirt or brush or dangling just above the ground. (The snares are designed for small game, not gorillas.) The rope is attached loosely to a bent branch and then firmly to a tree. When an animal steps or reaches into the loop and disturbs the branch, the branch springs up and pulls the noose tight, leaving the victim tethered to the tree. The more the animal struggles, the tighter the noose becomes. To disable the snare, the gorillas break the bent branch, releasing the tension on the rope. Sometimes they also pull the rope out of the ground. All of this they manage to do without becoming caught in the snare themselves. This brought to my mind two important questions: How did they learn to do this? And why do they do it? In the first question, I am not talking about the young gorillas observed last week. Those, it can be safely assumed, learned from their elders. The real question is how did the first mountain gorillas learn to take apart a snare? Did they just figure it out on their own or might they have learned it by watching people? These too are questions that can’t be answered definitively. 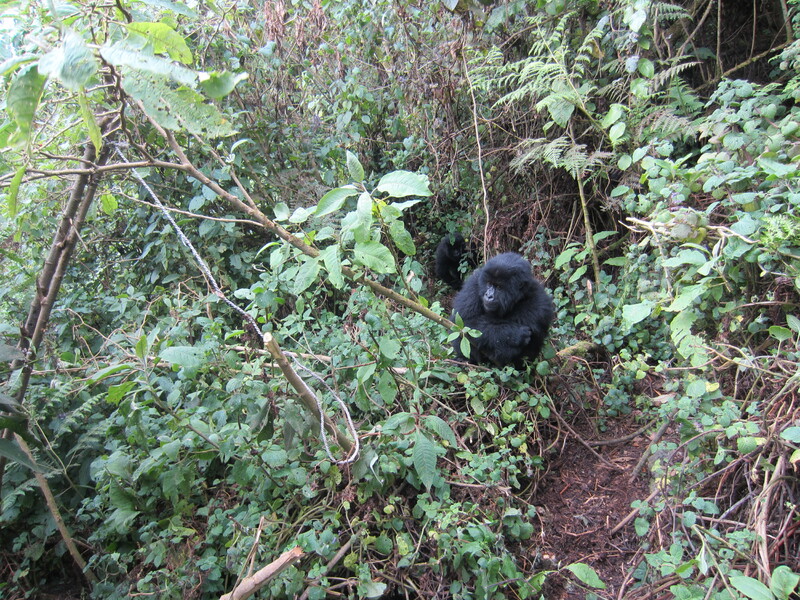 Erika didn’t know of any studies that have directly addressed snare responses in mountain gorillas. However, decades’ of observational data have been recorded by trackers and field researchers, all of which have been put into a database. Potentially this could be mined to put together a narrative on the emergence and perfection of snare disabling by gorillas in the region. One thing is true, however: Given the number of snares in the region (anti-poaching teams remove between 1000 and 2000 snares a year) and the fact that a handful of gorillas become caught in snares every year, the apes certainly get plenty of exposure to snares and opportunity to learn about snare-removal. As well, gorillas and other apes are well-known for their ability to problem-solve. Captive orangutans, for instance, are famous for their ability to escape enclosures through inventive means, including using objects to ground out electric fences and stealing keys to unlock gates. A gorilla would have little difficulty figuring out how to disable the snare without getting caught. The second question is trickier: Why do the gorillas dismantle the snares? — Gorillas recognize an inanimate object as dangerous. This interests me because I’m having trouble imagining when that might occur in the wild. Do apes recognize and remove natural, but dangerous, objects from their vicinity—maybe a toxic plant or a falling branch? Captive apes are regularly exposed to inanimate dangers, usually man-made. These they learn to avoid. In Apes, Language, and the Human Mind, Sue Savage-Rumbaugh relates how her famous linguistic bonobo, Kanzi, stuck a screwdriver into a wall socket and quickly learned a painful lesson. He immediately began throwing toys at the socket and, using gestures, insisted that Savage-Rumbaugh do the same. —Gorillas understand if they act on an object, they can prevent the object from causing harm. This is different than stopping an object while it is doing harm, such as chewing a noose off of a leg. It is also different from acting on an object to gain a reward, something animals do routinely. What kind of thinking does that entail? In their mind, is it equivalent to “killing” the object? –The gorillas understand that they only need to disable the snare, not get rid of it altogether. When they finish dismantling the snare, they leave the parts and move on. Does this mean they have a concept of “broken”? How would this understanding show up in a natural setting? –Mountain gorillas see the snares as dangerous even if they, themselves, have not been caught in a snare. Does this mean they are acting because they saw another animal (either a gorilla or game animal) suffer pain or death? This touches on the idea of empathy – “I feel your pain” –something animal behaviorists and psychologist will probably argue over forever. Is this young ape dismantling a snare to protect others? As to the mental states the chimpanzee may infer, consider those inferred by our own species, for example, purpose or intention, as well as knowledge, belief, thinking, doubt, guessing, pretending, liking, and so forth (Premack & Woodruff 1978). –The gorillas are acting on behalf of other animals. Silverbacks routinely give warning grunts when people or other gorillas approach a snare. These are not general announcements like prairie dogs give when a hawk flies over. These are directed warnings targeting the animal that’s in danger. One measure of empathy is targeted helping – that is, helping another based on his or her specific situation and goals. DeWaal points out that the literature is abundant with records and observation that such helping is present and persistent in apes. Our interpretation is that Shinda’s behaviour was particularly interesting. It could easily be assumed that Shinda associated Ymke with the snare and reacted to the danger by assaulting her. But take into account the time that these gorillas have spent in the company of Karisoke researchers — almost every day of their lives since birth — and their ability to distinguish between human individuals. We believe that Shinda was actually dissuading Ymke from coming into contact with the dangerous object, that his punishing bite may have been intended as a lesson. –Gorillas recognize that a snare embodies a potential future threat – something that “could happen.” Now we’re veering into messy territory. Do gorillas and/or other non-human apes have an awareness of future? Can they engage in “mental time travel”? Again, that’s not something that’s going to be settled easily. Planning, by way of saving tools for later use, is well documented among apes. An escape artist orangutan named Fu Manchu, let himself out of his enclosure several times by hiding a piece of wire in his cheek and using it later to pick the lock. On the other hand, primatologist, Tetsuro Matsuzawa, points out in The Primate Mind that while chimpanzees may be able to remember things they encountered in the past and have expectations about the future, they live in the world of the “here and now.” They do not have the ability to imagine an unknown future state. If this is true (and it seems likely) then it may be that gorillas are reacting to the “here and now” of the snare – removing it because it presents a clear and present danger at this moment. Why do the gorillas dismantle the snares rather than just avoid them? That question bothered me for days. It seemed to me that taking a different path or resting in an area away from a known snare made the most sense. Why should an adult male gorilla put himself in harm’s way to remove a snare? It’s not like the snares actively attack gorillas. They just sit there quietly until they are triggered. I started thinking about it. Most of the snare victims are infants and young gorillas. These little animals are playful, inquisitive, and don’t yet recognize or understand snares. How would parents keep them away from snares? They could warn them when they approach a snare or even chase them away from it. Researchers have seen that happen. But if the infant doesn’t even know what he’s looking out for, he’ll probably step in a snare the minute nobody’s paying close attention. For humans, it’s safe to tell our ten year old to be careful with carving knives. But for toddlers, we hide the knives away. We also put covers on electrical outlets, put a gate at the top of the stairs, and keep hot coffee cups out of their reach. There’s no other way to keep a baby safe. So, maybe snare-removal is simply the gorilla’s way of baby-proofing the forest. Over the past 40 years, the knowledge of how to disable a snare has been passed from silverback to silverback. Now we know that it also passed down from generation to generation. No matter how or why it’s done, the mountain gorillas of Volcanoes National Park have made snare removal part of their culture. One can only hope that the culture of snare-setting by local hunters dies out long before this intelligent, but highly vulnerable species meets an untimely end. To help the mountain gorillas, please donate to The Dian Fossey Gorilla Fund International. NextFriday Fiction Facts: Lost in the Woods! Baby-proofing the jungle is going to be tough work! Excellent article,, Kim. The more we learn about the minds of these amazing animals, the more humble we can become about our own role in their lives. I find your distinction between inanimate and animate objects interesting, as well as your distinction between natural and unnatural. Maybe from a human’s point of view this seems relevant, but it’s very debatable as to whether these distinctions and dichotomies are relevant for wild nonhuman primates. Further, these snares ARE a part of their natural environment. Saying that they aren’t is merely promoting the artificial separation of humans from nature, which limits our understanding of biology, ecology, and ourselves. Chimps also break snares, but my guess is that great ape cultures can only learn and pass along a certain number of complex behaviors. Chimps use different tools in different areas, but no chimp group uses all of them. It’s great that mountain gorillas have learned this new behavior, but I’ll guess it has a price in terms of less attention being paid on teaching young gorillas other adaptive behaviors. Presumably this one is more important, but that doesn’t eliminate the price. @ Brandi and David: I absolutely agree, there really isn’t a distinction between “natural” and “unnatural” when we’re talking about humans, apes, snares, and so forth. We’re all part of the same ecosystem. My musing had more to do with the behavior of gorillas before humans arrived (or in areas where there are no snares.) While I am familiar with gorillas and chimps attacking, for instance, a snake, I cannot think of any cases where they attack or remove something inanimate that is dangerous. @Brian: Gorillas and chimps learn via a “master-apprentice” approach. This means there is no active teaching, demonstrating, or correcting. Instead, the adult gorillas just go about their business and the young one just watch, try it for themselves, and eventually learn. However, I can imagine that snare-removal itself takes up time that might be spent on other activities. It seems that removing a single snare is quick — a matter of a minute or so. But when there are hundreds .. it does make you wonder. Thanks Kim. My guess (only a guess) is that it’s less a matter of time spent on the activity and more an issue of how much cognitive capability the great apes have. They can only learn and retain a limited amount of complex behaviors that require a higher level of understanding. I’m not denigrating them – I’m a rock climber, I know some rope tricks, and I forget them easily. My idea could be tested on captive apes by seeing if acquisition of a new complex behavior degraded the ape’s performance on prior-learned behavior. @Kim: Excellent article, very many thanks! I have heard, and once seen TV evidence, that chimp and gorilla moms will slap their babies until they pay attention to what mom is doing if the task is difficult. That would, in my view, go slightly beyond the master-apprentice approach, making the learning-by-watching somewhat less haphazard. Great blog on an important issue. 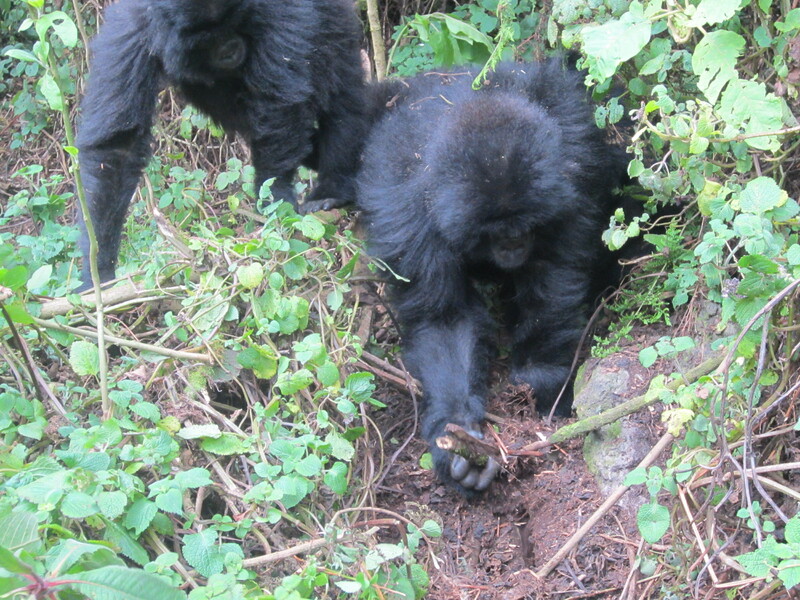 A further piece to ponder: if Silverbacks have learned to dismantle snares is one thing. Are there examples of other (naturally occurring) dangers that they have learned to render harmless? Is this one example a one-off response to man, or just another step in their dealing with life? What other dangers do they avoid? Are they any they actively work on or disable? Just wondering. Much to think of here in the concept of forming intent, abstraction, learning and teaching.